RadSpreadsheet comes with pre-defined UI that is automatically wired with all of the commands provided by the control and shows its full potential. RadSpreadsheetRibbon automatically registers the UI components of RadSpreadsheet and keeps them up-to-date after each upgrade. 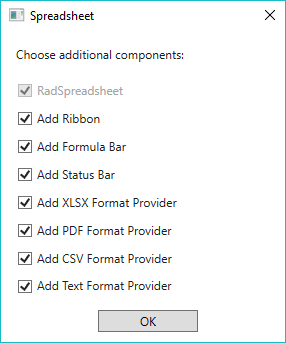 RadSpreadsheetRibbon control compliments RadSpreadsheet, with convenient ribbon exposing the variety of features the latter supports. 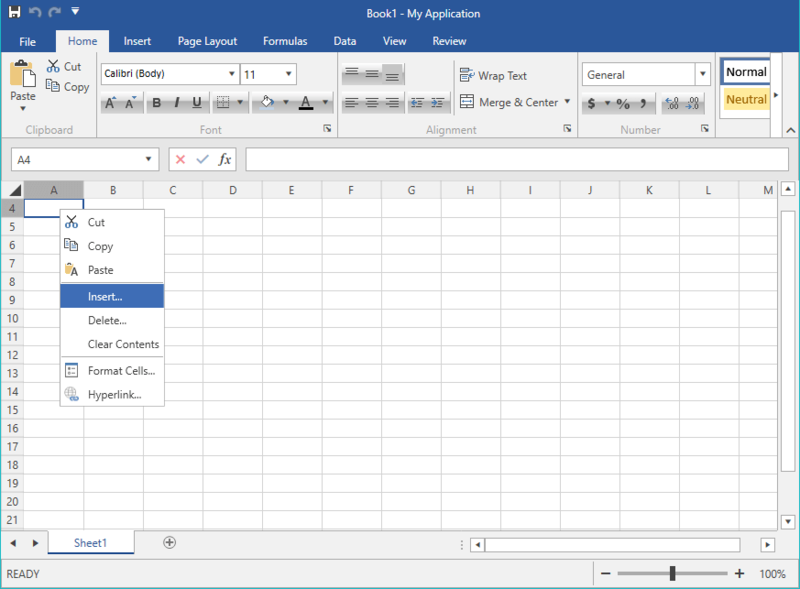 With few lines of XAML you get all the UI expected from a standard spreadsheet editing application, including multiple ribbon tabs full of commands, styles gallery, formula and status bar. When updating from version to version, you'll automatically get UI for all the new commands we expose. This functionality is available since R1 2018 and supported in Visual Studio 2012 and later versions. The different visual elements of RadSpreadsheet are described in the Visual Structure help article. Add XLSX Format Provider: Registers the XlsxFormatProvider in the FormatProviders collection of RadSpreadsheet. Add PDF Format Provider: Registers the PdfFormatProvider in the FormatProviders collection of RadSpreadsheet. Add CSV Format Provider: Registers the CsvFormatProvider in the FormatProviders collection of RadSpreadsheet. Add Text Format Provider: Registers the TxtFormatProvider in the FormatProviders collection of RadSpreadsheet. More information about the FormatProviders property of RadSpreadsheet is available in the Import/Export topic. Example 1 shows how the XAML generated after enabling all options looks like. When you would like to change the way RadSpreadsheetRibbon looks like, or add custom functionality to it, you can extract its template. 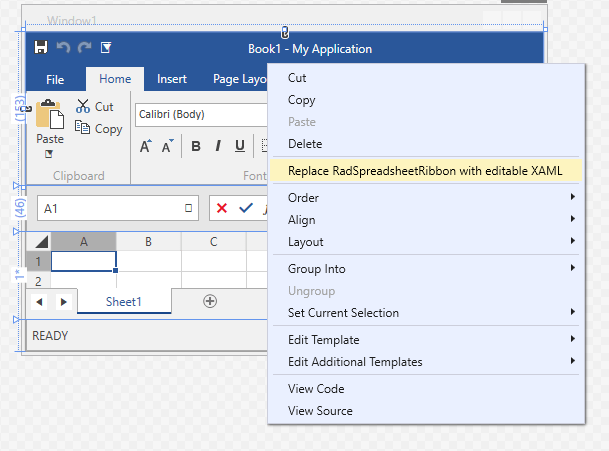 This can be achieved through the Replace RadSpreadsheetRibbon with Editable XAML option of the Visual Studio Designer's context menu. Note that in this scenario, the RadSpreadsheetRibbon is replaced by its XAML code. Doing this, you will not be able to receive updates for the control and will not be able to take advantage of the styling functionalities. Extracting the template of the default context menu can be done using a pretty similar approach to the one described for RadSpreadsheetRibbon. Just right-click on RadSpreadsheet in the designer of Visual Studio and choose Replace Default Context Menu with Editable XAML. You can also disable the default Context Menu or replace it with a custom implementation.